Laura has such a wonderful way of writing. She easily draws the reader into her storyworld within the first few sentences! Her attention to historic language and detail is natural and captivating, never overwhelming. In The Mistress of Tall Acre, she definitely captured my attention in the prologue and held it right until the last word of the epilogue! Both Sophie and Lily Cate were equally charming and loveable. I wanted the best for both of them! Somewhere around the halfway mark, I guessed the dreaded twist that was coming. I'm not sure I was totally happy with the resolution of it all (hard to say more without giving away spoilers), but the whole situation definitely tugged at my heartstrings! The Mistress of Tall Acre was the perfect blend of history, love, and mystery. 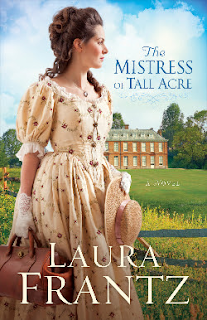 Historical romance readers will love Laura's newest book! Thank you to Laura and Revell through Revell Reads for sending me a copy to read and review!